SALT LAKE CITY – The Church of Jesus Christ of Latter-day Saints released a statement Friday reporting that the cancer affecting Elder L. Tom Perry, one of the church’s apostles, is terminal and has aggressively spread. Perry was diagnosed with thyroid cancer in April and has been undergoing medical treatment for the malady. 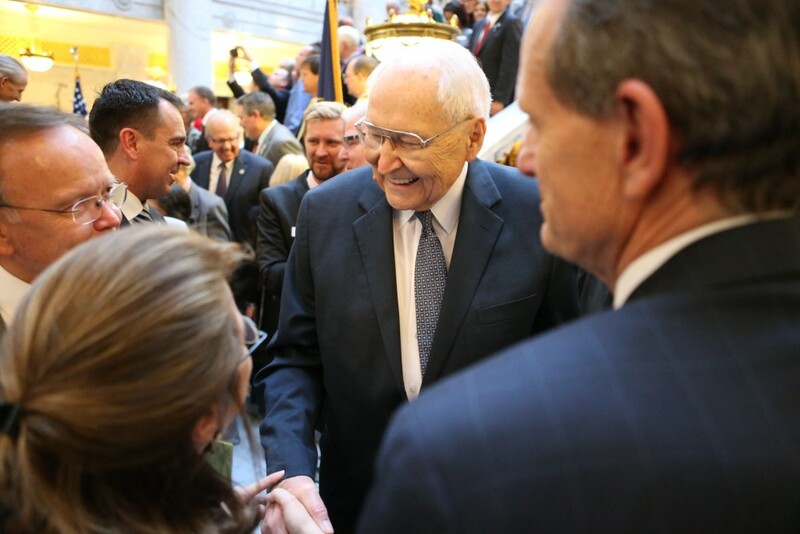 At 92 years old, Perry is the second-most senior apostle in terms of length of service in the quorum of the twelve, and the oldest living apostle. Elder Perry has asked that we share his thanks for the prayers and kindness extended to him by church members and friends. Despite earlier treatments, cancer has spread aggressively to his lungs and beyond. Elder Perry is at home. He will no longer attend meetings, though he is still receiving visits from members of the quorum of the twelve, the First Presidency, and close family. He will begin receiving hospice care in the coming days. According to his biography at LDS.org, the church’s website, Perry joined the church’s Quorum of the Twelve on April 6, 1974. He served an LDS mission to the northern United States in 1942, followed by two years of service with the U.S. Marine Corps in the Pacific Theater of World War II. Within the church, Perry has also served in ward bishoprics and stake presidencies before becoming an assistant to the twelve in 1972, followed by being called as a church apostle two years later. Professionally, his career been spent in the field of retail business where he has worked as the treasurer for companies in various states. Being an Apostle and all, I wonder if his faith wavers as he approaches the inevitable? Just being 92 is terminal, what’s the story here?